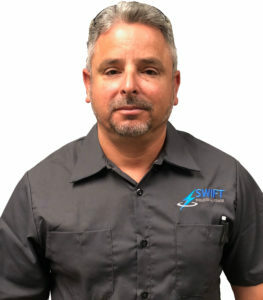 Fort Lauderdale, Fla. – Swift Industrial Power is pleased to announce the hiring of George De La Hoz, who will serve as the service manager for Swift’s Fort Lauderdale location. He brings more than 28 years of electronics and maintenance experience, along with 15 years of management success to Swift’s south Florida team. De La Hoz will manage day-to-day service operations, as well as technician development and training. Additionally, he will play a key role in promoting the company’s service offerings to potential customers in Broward, Palm, and Dade counties in south Florida. Swift Industrial Power is located in Fort Lauderdale at 10340 NW 53rd Street. The company has other locations across the southeast, including Jacksonville, Lakeland, Knoxville, Nashville, Trussville, Mobile and Dolomite.